(n.p. ), 1922. 1st Printing. Burnt orange, card stock wrappers with gilt lettering to upper wrapper. Tan card stock leaf with black lettering. All bound together with black (tassel) tie. Now housed in a mylar sleeve. A VG+ copy. Light scuffing to upper wrapper, age toning to all edges, internally clean and bright.. Loose leaf house in larger wrappers. 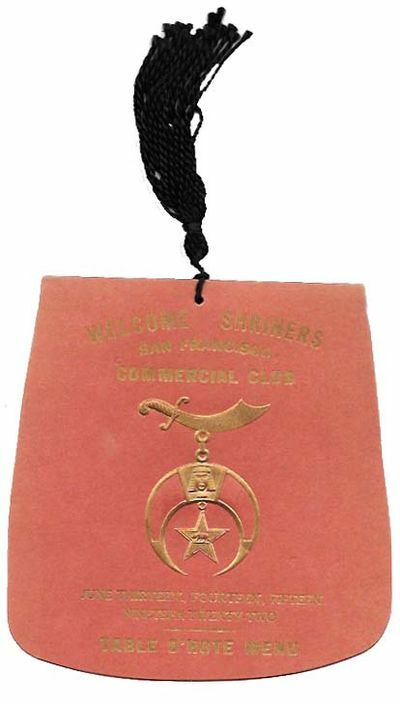 Symbol of the Shriners embossed to upper wrapper. Approx: 5-1/2" x 5-2/8"
The menu itself slightly resembles a fez - a type of hat typically worn by Shriners.